5 Steps to brow perfection. 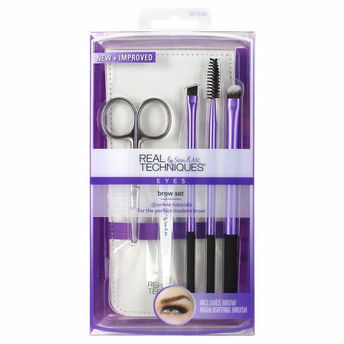 Define the perfect arch with Real Techniques Brow Set. It includes all the tools you need to clean up, fill in, define, shape, and highlight your brows. Brow scissors: Stainless steel with rounded tips for trimming fine hairs. Angled tweezer: Stainless steel with flat edges for expert brow shaping. Brow brush: For applying and blending colour naturally. Brow spoolie: Fine, firm bristles for grooming stray hairs and blending brow colour. Brow highlighting brush: For a clean bold brow, finish your look by highlighting or concealing . Case: Keeps tools organized on-the-go.